The body has been removed and taken to the state morgue. 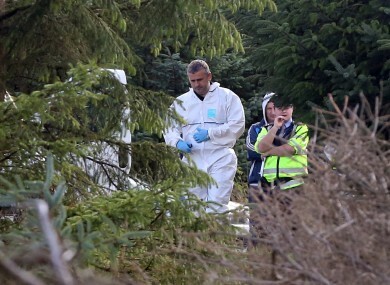 Gardai and members of the technical bureau pictured at the scene where human remains were discovered on Kilakee Mountain. A POST-MORTEM IS due to be carried out on human skeletal remains discovered at Killakee Mountain, Rathfarnham, in Dublin on Friday evening. The remains were discovered a member of the public walking in the Dublin Mountains at around 7.30pm. The scene was preserved for a technical examination and the Deputy State Pathologist Dr Michael Curtis attended the scene yesterday and the services of a forensic anthropologist were requested, Gardaí said. The body has now been removed and taken to the state morgue. It is understood that the state pathologist has indicated the remains are most likely those of a woman or a young boy. It is hoped that DNA of the remains will be useful in the identification of the remains. Email “Post-mortem on skeletal remains to take place today”. Feedback on “Post-mortem on skeletal remains to take place today”.